1. Seriousness of any health condition. We advise those fighting cancer or another health condition to take the aggressive or aggressive plus essiac tea dosage. The aggressive dosage is best for traditional health improvement; the aggressive plus essiac dosage is best for those undergoing chemo and/or radiation treatment. 2. Tolerance for the taste or consistency of the tea. Some people find it hard to drink the tea due to its taste and consistency. 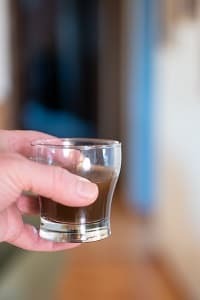 Although the tea tastes somewhat bitter and slightly thick to drink, many people tolerate it just fine, and you should adjust to taking it within a week if you take it daily. We recommend swallowing the tea without tasting it (meaning to not breathe through your nose and to not keep it in your mouth long). Remember, the tea is more effective if you do not strain it before serving. Shake your container before pouring your doses to disperse the herb particles that remain. If you cannot drink you full dose, drink as much as possible. 3. Body weight. Lighter people may require smaller essiac tea dosages, while heavier people may need more essiac to achieve the same level of effectiveness. However, if you are at a normal adult bodyweight, no need to change the dosage. If you need essiac tea dosage for children, click here. How to brew essiac tea. Typical recommended essiac tea dosage is 9 oz. per day, taken in three separate 3 oz. doses. This is the recommended essiac tea dosage if you have (or suspect that you have) cancer or another health problem. You should remain on the aggressive dosage program for a minimum of five months, or until your test results return to normal. If your test results have returned to normal, you may reduce your essiac tea to the maintenance dosage of 3 oz. just once per day. If at any point your symptoms return, we recommend that you return to the aggressive dosage of three 3 oz. doses per day. If the original condition persists even while you take essiac tea, continue on the aggressive treatment dosage until your condition improves and you're satisfied with the results. Keep in mind that many people keep getting worse and worse if they are not taking essiac, so sometimes just holding steady health-wise is a victory. Essiac can be taken during traditional cancer treatments without interfering with that treatment. If you are currently receiving chemotherapy or radiation, be aware that chemo and radiation can destroy some of the active properties of the essiac tea. In other words, chemo and radiation can prevent essiac tea from doing its job somewhat. Taking "extra" tea to compensate for this acts as insurance that the essiac you're taking will be able to do its work in your body. If you plan to continue your chemo and/or radiation, you might consider taking up to 18 oz. of tea per day, or three 6-oz. doses. Many people on chemo and/or radiation have tried the 18 oz. per day with good results. However, some decide to stay with just 9 oz. per day, and many of those people have also had good results. You'll have to decide (along with the help of your practitioner) if you'd like to experiment with taking the 18 oz. per day. The more cautious approach would be to take the higher 18 oz. per day. For the highest level of treatment, take 6 oz. of brewed tea three times per day. Maintenance Dose: The maintenance (or preventive) essiac tea dosage is 6 oz. of tea per day, taken in two 3 oz. doses of brewed tea. Administer the maintenance dose for at least 6 months after your test results have returned to normal. Many people choose to continue the maintenance dose indefinitely to maintain their good health. Some also take a maintenance dose of essiac tea as a daily preventive supplement, even though they have no health problems. Essiac tea is abundant in many minerals and is a healthy part of the daily diet. The length of time you should remain on a maintenance dose of essiac will ultimately be your decision. At bulk-essiac-tea.com, we choose to stay on essiac at all times to maintain our good health, and we encourage our friends and family to do the same. Essiac can be taken indefinitely, so it's up to you to decide whether to continue on the maintenance dose or to stop using essiac you've achieved good health. Detoxification Dose: Detoxification regimens are typically done for a fixed period of time. Many people choose 3- or 6-month time periods for detoxification. 2-6 oz. of tea per day would be a typical detoxification dosage for this time period. However, some do shorter but more intensive detoxifications. The essiac tea dosage for a 2- or 4-week detoxification is 9 oz. per day, taken in three separate 3 oz. dosages. 1. Your exposure to toxins, including chemicals, pollution, diet, etc. 2. Your body's ability to purge itself of toxins. 3. Personal preference and how healthy you feel. If you need further help regarding essiac tea dosage factors, please contact us and also talk to your healthcare practitioner. Store packets of herbs in a cool, dark place. Unopened packets of herbs stay fresh for at least one year. Do not put the herbs in the refrigerator. Your brewed essiac tea must be refrigerated, since there are no additives or preservatives. Do not store brewed tea for more than two weeks, because the tea may spoil. Store your tea in spring water gallon containers or glass bottles. Dark bottles are not necessary, as your refrigerator should be dark inside, therefore any exposure to light is neglible. Clean all containers thoroughly with hot water before using them to store your tea. A fresh batch of essiac tea should be prepared every 2 weeks.